We're returning to back-to-back UFC shows as the promotion hopes UFC on Fox 24 helps extinguish any memories of the incompetency shown by the New York State Athletic Commission last week at UFC 210 in Buffalo, New York. UFC on Fox cards tend to be fun and its 24th edition is no different. The event is headlined by a long overdue flyweight title bout between champion Demetrious Johnson and Wilson Reis—a fight originally slated for UFC 201 last year. In addition, there is a fun strawweight fight pitting Rose Namajunas against Michelle Waterson serving as the co-main event, which follows a middleweight battle featuring Ronaldo "Jacare" Souza and rising Aussie star Robert Whittaker. Thanks in part to the considerable star power featured on this show and the fact the fight was only announced less than a month ago, one contest being overlooked is the heavyweight clash between former Bellator champion Alexander Volkov and former IFL champion Roy "Big Country" Nelson, acting as the supposed headline act for the preliminary fight card. This fight signals the second time the giant Volkov, who stands at a towering 6'7", steps into the Octagon, while this is the first in-cage appearance of Big Country since he decided to give referee John McCarthy a swift kick for what he deemed to be a late stoppage of his opponent Antonio "Big Foot" Silva. Along with earning the chagrin of UFC president Dana White, Nelson's actions also got himself in hot water with the Brazilian Superior Justice Court of MMA (STJDMMA) which initially handed him a nine-month suspension and a fine of $24,000. However, this punishment was lessened to a six-month suspension and a $13,700 fine once he had released an official statement apologising to McCarthy. Nelson's September knockout win over Silva signalled his second victory in three fights. Though that may not sound overly impressive, that win—along with his defeat of Jared Rosholt sandwiching a split decision loss to the streaking Derrick Lewis—is a welcome return to relative fighting form after a skid which saw the Las Vegas native lose five of six fights. It was an alarming run for the now-40-year-old, who was once considered among the best in the UFC's heavyweight division. But it's worth remembering that all his UFC losses bar two—to the aforementioned Lewis and Mark Hunt—have come to former UFC and Strikeforce champions: Stipe Miocic, Fabricio Werdum, Daniel Cormier, Junior dos Santos, Alistair Overeem, Frank Mir and Josh Barnett. Despite his slump in form, Nelson still retains a .500 record in the UFC with nine victories and nine defeats and is very much enjoying what he's doing inside and outside the Octagon as the UFC's second-oldest active fighter in the UFC heavyweight division—harbouring hopes of someday getting his rematch against those who have bested him in the cage. "I think guys that retire, they just don't love what they do—I love what I do," Nelson told MMAjunkie. "I don't mind getting in there and getting in some scraps. I actually hate fighting, but I love the sport of MMA and I love going out there and just doing jiu-jitsu and boxing. It's one thing that makes me get up in the morning. "I'm just waiting for rematches. You name everybody I've ever fought and anybody I've ever tried to get a rematch; they don't want to fight me again. And there's a reason why, and it's because they're either scared or afraid to lose again. I remember when Junior [dos Santos] fought Cain [Velasquez], everyone was like, 'Oh my gosh.' Then Cain beat the crap out of him the last two times." While Nelson is admittedly on the downturn of his career, Volkov is on the rise as a 28-year-old. 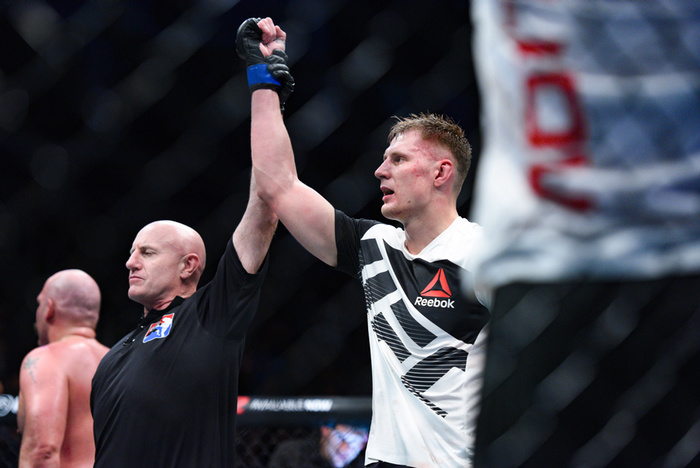 Nicknamed "Drago" for his resemblance to Rocky's Russian arch-nemesis, Volkov is currently riding a three-fight win streak and holds an overall record of 27-6—with 18 of those wins coming by knockout. His height and rangy limbs have provided plenty of issues for his opponents in the past, which could prove a factor in Saturday night's fight with Nelson who, despite his weight, is considerably undersized as a heavyweight. In addition to Bellator gold, which he later lost to unbeaten countryman Vitaly Minakov, Volkov also won the M-1 Global heavyweight championship against Denis Smoldarev in 2016 before defending it against former Bellator light heavyweight champion Attila Vegh. Entering the UFC as M-1 champion, Volkov's Octagon debut left a lot to be desired. The Russian had his hand raised in a split decision win against Timothy Johnson at UFC Fight Night: Mousasi vs. Hall 2 in Belfast, Northern Ireland, but it was most definitely a case of poor judging with every media member polled by MMADecisions.com scoring the fight in the American's favour. Now, Volkov gets the opportunity to alleviate any memories of dodgy scorekeeping by taking on a big name in Nelson—a fighter he claims to have watched as a fan before deciding to take his karate stylings to the cage. "He's a good, experienced opponent," Volkov told RT. "I'd say it's the biggest challenge of my career so far. He's a veteran with a big name and one of the fighters I looked up to growing up, he's a solid opponent. However, I feel that I'm ready to face serious opponents and win, that's why I'm preparing to the best of my ability. "Nelson has a fan base in Russia, a lot of my friends follow him and I always liked him too. MMA fans like him and it's because of him that our fight will attract attention, but if the fans want to root for me, I certainly wouldn't mind. One of my keys could be my height and I'll use it to my advantage when striking. Striking is my style after all, and I'll look for a stand-up fight. But I'll be ready for everything, as I always am." Like in boxing, the MMA heavyweight landscape has long been yearning for young blood. With youth and size on his side, Volkov could be the man to spearhead the upcoming generation of heavyweight fighters in the UFC. However, Nelson has form of knocking out bigger opponents, see Stefan Struve, and Big Country would love nothing more to beat yet another up-and-comer to defy the man he's constantly at loggerheads with in UFC president White.